Autumn is the right time to plan a leaf-peeping road trip to take in breathtaking views of fall foliage in various areas throughout the United States. According to Travel Channel, autumn leaves typically start to show their colors in the northern areas of the U.S. in early September and put on a brilliant show that spreads southward through October and even into early November. Of course, predicting peak leaf color is not an exact science and peak viewing times may vary a bit each year based on a variety of climate-related factors. With its charming landscape and way of life, Vermont is one of the first destinations that comes to mind for planning a leaf-peeping get away. The state's Green Mountain Byway (Route 100) in northern Vermont is recommended by Fodor's Travel as one of the best U.S. trips for viewing fall foliage. Chris Skilling of VBT Bicycling and Walking Vacations gushes, "As fall rolls into Vermont, the Green Mountains light up, blazing with gold, orange and red leaves. It is truly one of the most beautiful sights in North America." Trees along the byway include sugar maples, sumac, elm, oak, sweet gums, hickory, birch, and poplar. There are numerous charming accommodation options along the way. When to visit: The first week of October is generally the best time to see color here though the leaves typically start to change in mid-September. 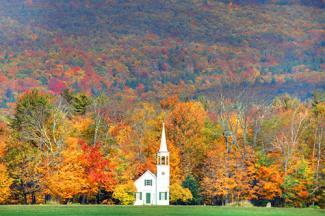 Vermont.com publishes fall foliage reports throughout the season. 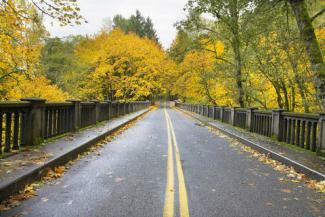 Viewing the foliage: You can drive all or part of the 138-mile byway and enjoy spectacular views from your car. The byway passes through 20 towns, three state parks and two state forests. There are plenty of opportunities to hike for an up-close and personal view full fall foliage. You can event get "a bird's-eye view" of Mount Mansfield - the state's highest peak - from the ski gondola in Stowe. For a more outdoorsy option, participate in a multi-day guided walking tour. If you don't want to limit your northeastern leaf viewing excursion to just Vermont, consider planning a trip through the entire New England region, which has long been a desirable destination for leaf peepers. Tourists flock to the six New England states each autumn to see the leaves change, with visitors spending an estimated $3 billion across the region each year. You'll see many types of trees in New England, including ash, birch, sumac, elm, gum (sweet and black), maple (sugar and red), hickory, red oak and many others. Fall leaf colors include gold, yellow, orange red, magenta and purple hues. Leaf Peeper packages and romantic getaways are available at inns, resorts and hotels throughout the region. When to visit: According to Skilling, elevation impacts color intensity. He states, "In New England, colors peak in the higher elevations in the northernmost part of the region in mid-September, moving toward the south through October." 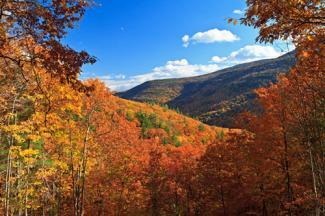 See YankeeFoliage.com for a fall color forecast map that you can use for planning purposes. Viewing the foliage: Discover New England recommends a week-long, 700 mile itinerary that ends and begins in Boston, Massachusets and includes parts of Rhode Island, Massachusetts, New Hampshire, Vermont and Maine. This itinerary provides travelers with an opportunity to view autumn color across valleys, mountains, ferry and more. If you want to leave the driving to someone else, several companies offer bus tours of the area. Hiking is also great way to view leaves, and Trails.com has a great list of the "best leaf peeper hikes in New England." Active travelers may want to consider a multi-day guided bicycling tour. The Catskills in the southeastern region of New York are also recommended by Fodor's Travel as one of the best places to see fall foliage in the United States. This area includes Delaware, Greene, Ulster and Sullivan Counties of New York. It occupies 6,000 square miles and is home to several mountains and river systems, making it a stunning location to see the leaves change. Trees located throughout the Catskills include American beech, sugar maple, Eastern hemlock and red oak, allowing for a spectacular showing of yellow, orange and red leaves throughout the fall. There are many great places to stay in the Catskills. When to visit: The last two weeks in September are typically the peak time for viewing fall foliage in this area, although you can usually see the colors start to change a few weeks in advance. Viewing the foliage: Foliage.org recommends traveling State Road 23A "through the scenic towns of Cairo, Windham, Palenville and Hunter," as well as State Road 28, which will take you across the Catskills between Kingston and Arkville. They also recommend traveling from 28 A to County Road 47, where you can "enjoy a scenic 60-mile loop around the Catskills." Schedule a ride on the Catskill Mountain Railroad to enjoy a scenic ride surrounded by breathtaking views of the foliage. Travel + Leisure calls Oakland, Maryland, (a scenic small town in the western part of the state,) "the best town in America for leaf-peeping," crediting the dazzling display of fall color at nearby Swallow Falls State Park for the honor. Swallow Falls State Park is nine miles north of the town "and contains some of Maryland's most breathtaking scenery." The park is home to hemlock and white pine trees. In Oakland, you can enjoy the Autumn Glory Festival, an annual five-day fall festival held each year during early October. There are a few inns in Oakland as well as places to camp in the state park. When to visit: The foliage in this part of Maryland begins to change around the 20th of September with fall color continuing into October, according to Foliage.org. Viewing the foliage: Within Swallow Falls State Park, you can view spectacular scenery in a beautiful forest setting brought to life by fall color. 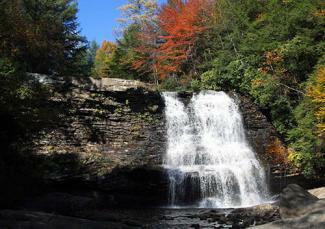 Highlights include the Youghiogheny River flowing through gorges along the borders of the park and a 53-foot waterfall. Drive through the park or hike - or both - to enjoy spectacular color, which you can also view throughout the town of Oakland itself. 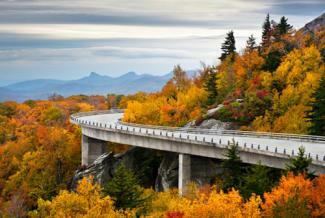 Bridging the area between Great Smoky Mountains National Park in North Carolina to Shenandoah National Park in Virginia, the Blue Ridge Parkway is recommended by SmarterTravel as one of the best U.S. drives for fall foliage viewing. The Parkway is home to more than 100 species of trees, making for one of the most spectacular autumn color shows that you can see anywhere. There are plenty of choices for accommodations, including two lodges and several campgrounds on the Parkway itself, as well as numerous nearby options in charming towns all along the way. 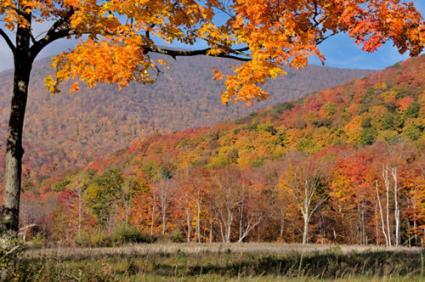 When to visit: According to Travel Channel, leaves start to change on the Parkway toward the end of September, though October is the peak month for viewing. Viewing the foliage: Whether you drive the whole distance or just park of the parkway, you'll be surrounded by spectacular color all along the way. There are over 200 scenic overlooks on the parkway for your viewing pleasure. Plus, as Travel Channel points out, you can park anywhere along the shoulder to stop and take in the sights. You aren't limited to four wheels - the Parkway is "considered by some to be a motorcycle mecca." Fodor's Travel includes Montana's Glacier National Park as one of its most-recommended spots for viewing fall foliage in the U.S., indicating that the park is "one of the best places to see larch trees." Country Walkers Vice President Jamen Yeaton-Masi also recommends this destination, pointing out that visitors will have an opportunity to "view brilliant shades of yellow and gold as aspen, cottonwood and tamarack trees display their seasonally coordinated colors." She continues, "The majestic backdrop of glacial-carved valleys contrast beautifully with the huckleberry bushes turned brilliant red in the fall." The National Park Service cautions autumn visitors to be mindful that park concessions close by late September. You can camp in the park during autumn though you'll need to seek other types of accommodations in one of the "gateway communities." When to visit: Time your trip based on the types of trees you'd like to see in full fall glory. Fodor's indicates that most trees change colors during September though the larch trees won't change until the middle of October. Viewing the foliage: You can drive through many parts of the park to view foliage and wildlife, and there are also numerous hiking trails for you to enjoy. For a guided experience, consider Country Walkers' six-day moderate to challenging guided walking tour of Glacier National Park. According to Yeaton-Masi, hikers will get to "combine the colors with hikes along teal-green lakes and white-water rivers." According to Travel+Leisure, Stillwater, Minnesota is among the top places to view fall foliage. Situated on the St. Croix River's western bank, this charming community is just minutes away from Minneapolis-St. Paul and the Wisconsin border. Forbes named Stillwater as one of the prettiest towns in America, and that beauty is only enhanced when the leaves turn to rich autumn hues signaling that winter is on its way. Oak trees are prevalent in Minnesota though the scenery includes many other native trees and shrubs. There are numerous lodging options, including bed and breakfasts, inns, and hotels. When to visit: Late September through the middle of October are the best times to view autumn color in the region of Minnesota where Stillwater is located. Viewing the foliage: The town of Stillwater is surrounded by blazing fall foliage throughout autumn, so you can catch a glimpse of rich fall foliage from wherever you are. 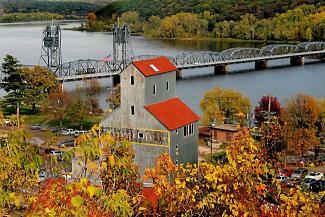 Visit a park, enjoy a hike or bike ride, or view Stillwater's fall foliage directly from the St. Croix River with a boat tour on a replica paddlewheeler. SmarterTravel recommends Oregon's 75 mile Columbia River Highway as one of the top drives for enjoying fall foliage, promising the opportunity to "encounter the fiery hues of fall alongside brilliantly colored wildflowers, dramatic waterfalls, and deep gorges." Travel Channel also recommends this route as a wonderful place to see a "colorful display of big-leaf maple, cottonwood and Oregon ash trees." The Columbia River Highway is a national landmark known for it winding cliffs and spectacular beauty. There are several hotels near the Highway, including chains and local properties. When to visit: Travel Channel recommends mid-October travel for peak foliage viewing though points out that this area is incredibly beautiful any time of the year. Viewing the foliage: The highway itself was designed specifically to show off the region's natural beauty, so you will see spectacular fall scenery on every inch of the drive. 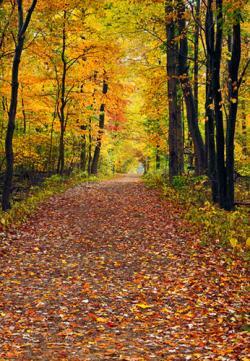 There is also plenty of opportunity for outdoor recreation activities offering wonderful fall leaf views. 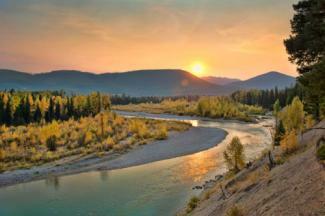 Options include hiking, fishing, bicycling, horseback riding and more. The viewing area at Multnomah Falls provides a particularly spectacular vantage point. Cuyahoga Valley National Park is recommended by Midwest Living as one of the region's best getaways for fall color viewing. Located less than half an hour away from Downtown Cleveland, this beautiful park is a nature preserve spanning 33,000 acres. According to the park's website, the landscape here includes a wide variety of trees - maples (sugar, red, silver, black), oak (northern, white and pin), black gum, dogwood, big tooth aspen and more. There are several camping and lodging options in and around the park, including several national chains. When to visit: The park's website indicates that peak color is usually visible during the third week of October though not all the park's trees peak at the same time. The entire month of October usually provides excellent views of fall foliage. Viewing the foliage: You'll be surrounded by fall foliage through Cuyahoga Valley National Park whether you are driving or outside of your car. The park features a 20 mile trail for walkers and bicyclists that provides a terrific leaf-viewing vantage point. There are even more trails (over 100 miles) for more adventurous hikers as well as horse trails. You can also enjoy a behind-the-scenes view with a ride on the Cuyahoga Valley Scenic Railroad. Colorado's 63-mile Grand Mesa Scenic and Historic Byway is listed by SmarterTravel as one of the best U.S. drives in the U.S. for viewing fall foliage. 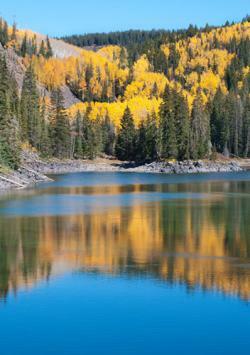 SmarterTravel describes Colorado's Grand Mesa, (known as the world's largest flat-top mountain,) as an ideal vantage point from which to witness the "tapestry of colors" visible in the state each fall. Part of Colorado's Western Slope, the Grand Mesa Byway winds through National Forest Land, providing autumn visitors with spectacular views of golden-hued aspens and other trees in full fall color. When to visit: September is generally the best time to view fall foliage in Colorado, particularly if you want to catch the aspens at their most glorious. Viewing the foliage: According to the Federal Highway Administration, you can drive the entire Byway in two hours, during which time you'll be surrounded by "evergreen mesa forests" and "forests of shimmering aspen and pine." Drive to the mesa's top for a breathtaking view from Land's End Observatory or hike Land-O-Lakes Overlook to catch glimpses of the many lakes in the area surrounding the Byway. Leaf peeping is a popular travel option, so planning ahead is key to enjoying a trip to the area of your choice. Yeaton-Masi points out, "Viewing Fall Foliage is a highlight for travelers, so some Fall Foliage tours often fill up three to six months in advance." No matter what part of the country you plan to visit to take in the colors of fall, be sure to make your reservations well in advance.